Teeth grinding can be an annoying habit, especially when it occurs during sleep. It hinders our ability to have a good nights rest, and often leaves our jaw painful and sore in the morning. The grinding also keeps our partners awake at night, causing them suffer from insufficient sleep; and not to mention the tooth damage that the grinding causes. Are you sick of having an aching jaw every morning? 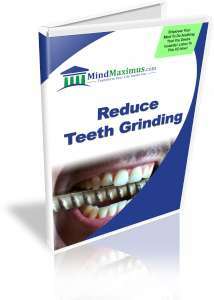 Do you often wish there was a way to stop the teeth grinding once and for all? Has your teeth grinding affected your relationship with your partner because he/she is unable to get any sleep? Because much of the teeth grinding activity occur during sleep, it can be a very difficult habit to fix. After all, how can you try to stop your teeth from grinding when you are unconscious and asleep? Thankfully, with today’s advanced Brainwave technology, we are now able to virtually ‘train’ our minds to slowly but surely eliminate the habit of teeth grinding. By aligning our brainwaves with the desire to relax our tensed jaw muscles during sleep, we can bring about the positive change that we’re looking for in our lives. We can finally get rid of our teeth grinding habits, and enjoy a deeper, more restful sleep at night! No reviews on F04 Reduce Teeth Grinding so far.